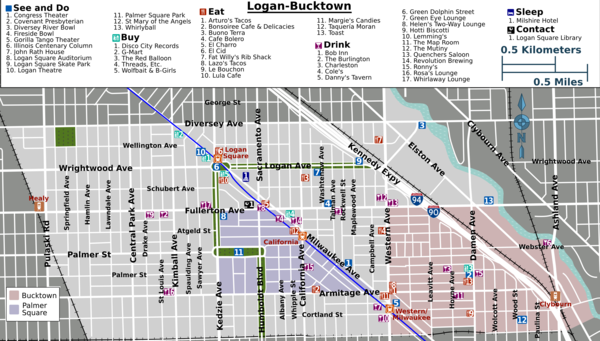 Logan Square is an expansive neighborhood with sweeping boulevards on Chicago's West Side. It shares a wealth of dive bars and cheap rock venues with Bucktown, which becomes a high-fashion destination when close to Wicker Park. And if you were a goat farmer in the city around that time, Bucktown was the place to be. You knew that you were in a place that understood the importance of goats, and that any goats you owned would be in good company. As home to farms, factories, and immigrants who were employed by them, Bucktown never developed any major tourist attractions, but it did support plenty of bars for discussions of issues both goat-related and non-goat-related, and that preponderance of cheap bars is still intact. Logan Square, on the other hand, was named for the Civil War hero Gen. John A. Logan, and its tree-lined boulevards — one of which bears his name — are what really set the neighborhood apart from its neighbors, offering wide-open spaces for leisurely trawls by cars, bikes, and pedestrians alike. (Fittingly, Ignaz Schwinn, founder of the Schwinn bicycle company, settled in Logan Square.) The neighborhood became a destination for immigrants who'd struck it rich in Chicago, and they helped build the beautiful housing stock that survives today, even after the business district collapsed in the 1950s. It's those magnificent graystones and richly detailed brick classics that draw waves of new residents to Logan Square today. Right now, it's the best of both worlds: murals and community gardens decorate the streets, and new residents kick portions of their salaries to businesses run by older ones, enjoying authentic taquerias on wide, sunny boulevards that are (mostly) rich with gritty, urban character and (generally) safe. Despite the critical shortage of goats at present, the chameleon-like Bucktown prospers from proximity to Wicker Park, with retail and restaurants that take their cues from the hipster paradise to its south, rough-and-tumble spots that resemble Logan on the other side, and new condos not dissimilar to Lincoln Park to the east. 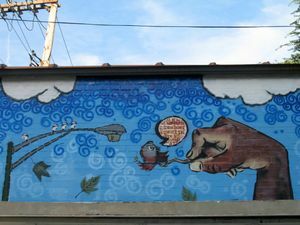 Bucktown is less notable than Logan Square in terms of looks, with a lot of same-y new construction hurried up to meet housing demand, but it also has some great bars and essential music venues with nightly bills of jazz, scuzz and genius. The O'Hare branch of the CTA Blue Line has stops in Bucktown (Damen, Western) and Logan Square (California, Logan Square). It runs all night. 49 Western runs through Bucktown all night, connecting with the Blue Line at Western and Armitage. 52 Kedzie/California travels on California through both neighborhoods, connecting with the Blue Line at the California station, and on to the Far West Side. 56 Milwaukee is the key route, running from Wicker Park, through Bucktown and Logan, and on to the Far Northwest Side. It connects near the Blue Line at Damen and again at California. 72 North runs a quick route between the Brown/Purple (Sedgwick) and Red (North/Clybourn) Lines and the Blue Line (Damen) at the center of the Wicker Park/Bucktown shopping district. 73 Armitage connects with the Blue Line at Western. 74 Fullerton connects with the Blue Line at California. 76 Diversey connects with the Blue Line at Logan Square. I-90/94, also known as the Kennedy Expressway, runs close to Logan Square and Bucktown. Diversey Avenue is the main exit for the neighborhood. Street parking is usually not a problem in Logan Square, but check for permit-only parking on side streets — the posted hours are a bit weird, and cops go on ticket binges every once in a while. Logan Boulevard itself usually offers plentiful open parking, though. Few drivers would consider the Kennedy Expressway sacred ground, but in 2005, what many believed to be an image of the Virgin Mary appeared on the wall of the Fullerton Avenue underpass. Divine revelation or water damage, the image attracted fervent devotion from local Catholics, who have diligently protected it from defacement attempts in the years since. If you'd like to decide for yourself, the spot is easy to find — look for the flowers, candles, and a few worshipers lost in prayer, especially in the morning. One of Logan Square's most celebrated features is Logan Boulevard itself, which is lined with century-old, show-of-wealth mansions. For an easy walking tour, start west of the I-90/94 underpass, and walk west to the Illinois Centenary Memorial Column, veering off to walk south on Kedzie for a few more blocks of the same. They're enjoyable by sight alone on a sunny day, but community groups like Logan Square Preservation  hold occasional guided tours and garden walks. The best reason to visit Bucktown and Logan Square is the music scene, which includes several bars — see also the below. There are two main shopping areas in Bucktown. The first is near the intersection of Milwaukee, Damen, and North Avenue, right at the border of Wicker Park, where you’ll find small, independent stores and boutiques. However, for the big-box experience, drive up to Damen and Elston, where a couple of strip malls offer major retailers and plenty of parking. 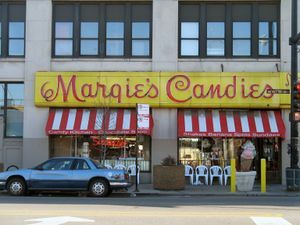 The six corners of Diversey, Milwaukee, and Kimball mark the center of the old retail district in Logan Square. It's an odd sight to see national chains like The Gap shoehorned into old art deco facades. The nearby Mega Mall (2500 N Milwaukee Ave) is gigantic, and when it's open, it's home to a dense jumble of stalls that has been compared to a third-world bazaar, chock full of cheap, shady merchandise. Health-code violations kept it closed for a while, and recently a fire brought commerce (as it was) to a halt. Logan Square covers a lot of culinary ground — stray off the beaten path and you'll find places serving Argentinean, Colombian, Cuban, Ecuadorian, El Savadorian, and regional Mexican specialties. Not far away, although a little difficult to find, the The Hideout (just east of Wicker Park) is definitely worth seeking out for live music. If you're only here for a show and the options in Wicker Park are too steep, you could commute from the hotel cluster by O'Hare Airport on the Blue Line. Both neighborhoods are reasonably safe, with standard precautions taken for an urban environment. Stay close to the bright lights after dark, and if you’ve had a lot to drink, use the money you saved on cheap beer for a taxi back to your hotel. As fashion follows the path of Polish migration, Avondale is often mentioned as the next place to receive the “hot neighborhood” treatment after Logan Square. Humboldt Park on the Far West Side has a major Puerto Rican community and a few cultural institutions that share an audience with Logan Square residents. This page was last edited on 22 October 2016, at 01:23.